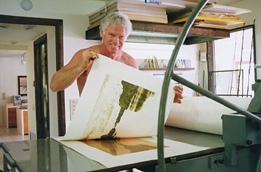 Hal pulling a Proof of an Etching/Aquatint on his intaglio press, 1990. 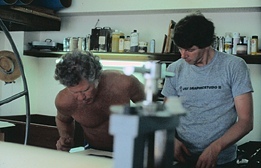 Collaborating with Master Printer Bob Townsend of Georgetown, MA, in Hal's etching studio, 1988. 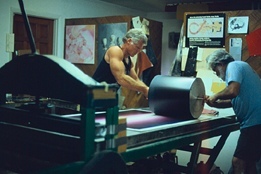 Inking a Rainbow Roll with Master Printer Julio Juristo, Topaz Editions, Tampa, Florida, 1990. 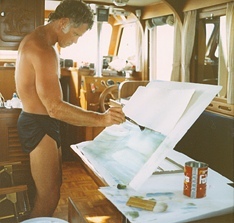 Creating a monotype, assisted by Julio at Topaz, 1987. 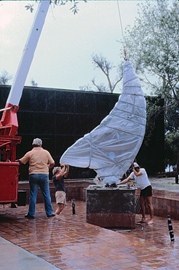 Arbor Shoreline Office Park,Clearwater, Florida, 1980.